Government of India have announced the Sale (re-issue) of (i) “7.35 per cent Government Stock 2024” for a notified amount of Rs. 2,000 crore (nominal) through price based auction, (ii) “7.59 per cent Government Stock 2029” for a notified amount of Rs. 6,000 crore (nominal) through price based auction, (iii) “8.24 per cent Government Stock 2033” for a notified amount of Rs. 3,000 crore (nominal) through price based auction, and (iv) “8.13 per cent Government Stock 2045” for a notified amount of Rs. 3,000 crore (nominal) throughprice based auction. The auctions will be conducted using multiple price method. The auctions will be conducted by the Reserve Bank of India, Mumbai Office, Fort, Mumbai on January 15, 2016 (Friday). Both competitive and non-competitive bids for the auction should be submitted in electronic format on the Reserve Bank of India Core Banking Solution (E-Kuber) system on January 15, 2016. The non-competitive bids should be submitted between 10.30 a.m. and 11.30 a.m. and the competitive bids should be submitted between 10.30 a.m. and 12.00 noon. The result of the auctions will be announced on January 15, 2016 and payment by successful bidders will be January 18, 2016 (Monday). The Government of India has announced the repurchase of “1.44 per cent Inflation Indexed Government Stock-2023” through reverse auction for an aggregate amount of Rs. 6,500 crore (face value). The repurchase by the Government of India will be undertaken to redeem the Government Stocks prematurely by utilizing surplus cash balances. The above repurchase of the Government Stocks is purely ad hoc in nature. Auction for securities will be on price based auction format. The auctions will be conducted using multiple price method. 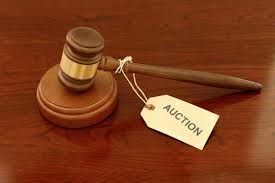 Bids for the auction should be submitted in electronic format on the Reserve Bank of India Core Banking Solution (E-Kuber) system on January 14, 2016 (Thursday) between 10.30 a.m. and 12.00 noon. The result of the auctions will be announced on the same day.